In the recent years there has been a lot of talk and even more projects about the bunkers that Enver Hoxha built in Albania during communism. Most of the discussion has been led by young creative Albanians that view these objects, or better yet artifacts not only as symbols of a suppressed and highly paranoid past but as prosporous shelters to be integrated in the future public life. Once symbol of a paranoid image of an enemy that never was, now transformed into an icon of what a full life could be in a free country. Once assigned to keep the enemy out, now re-purposed to promote tourism. There are also a few international artists, mainly photographers who have captured the current conditions of these bunkers a midst all urban, landscape and cultural transitions of the past twenty years. If we compare the way a local artist approaches the subject with how an outsider shots the object itself, we can clearly see the different dynamics of the work and how it behaves when it is put in a larger context or if we add more content, aesthetics aside. To the outside world this physically heavy object is a mystery and that's the main reason they're drawn to it. But to a local, it is not only physically but psychologically heavy too. It has left traces of unspoken, still not understood shrapnel that Albanians have put a lid on, but haven't dealt with yet. None the less, it's still a mystery to them as well. How would you compare it? For a more comprehensive understanding of what I am talking about, check out the above projects and read the article below. Last week, WIRED published an article about this same subject, you can read it below. Don't forget to check out that website for more photos from David Galjaard's book Concresco. “ In Albania, 750,000 Communist-era bunkers populate the landscape, relics of the paranoia and skewed priorities of former dictator Enver Hoxha. Now they exist as quirky homes, animal shelters, ad hoc storage and make-out spots. The peculiar program of bunkerization, which lasted Hoxha’s entire 40-year rule, resulted in one bunker for every four citizens. In November of last year, Dutch photographer David Galjaard won the 2012 Aperture Foundation/Paris Photo First Photobook Award for Concresco, a book that surveys the scattered and now repurposed or deteriorating concrete blobs. As much as the bunkers have intrigued historians, Galjaard laments how little the general public knows about Albania. The bunkers’ abandonment, reuse and reimagining for Galjaard reflects the changing politics, lifestyles and aspirations in the former Eastern Bloc nation. The Communist leader Hoxha rose to power in 1944 as leader of the Party of Labour of Albania and ruled until his death in 1985. Hoxha was on constant alert for political threats and maintained his position with routine immobilization, imprisonment and eviction of his people and political opponents. Hoxha’s suspicions also extended beyond Albanian borders and the bunkers, which number 24 to every square kilometer, and were built in preparation for a multi-front war Hoxha expected from invading countries, East and West. Every citizen in Hoxha’s plan was a reservist. Twelve-year-olds were trained to fire rifles. The bunkers never saw action. Construction costs were a huge drain on the small Balkan nation’s resources and diverted efforts away from improving roads or solving Albania’s chronic shortage of housing. The bunkerization program began in 1967 and ceased soon after Hoxha’s death in 1985. Today, Albania is extremely pro-West, particularly pro-American. In 2011, the prime minister erected astatue of George W. Bush in the town of Fushë-Krujë. Galjaard visited Albania three times over an 18-month period, spending a total of four moths in the country. The project is a thorough but open-ended look at the country and its people. Galjaard is not the first photographer to focus on Albania’s bunkers. Alicja Dobrucka has a similar project. What distinguishes Galjaard’s work was his decision to present the project primarily as a book. Galjaard raised money with help from arts organizations, some crowd funding, support from the Dutch embassy in Tirana, and not a small amount of his own savings — about 12,000 Euros, he says. The investment was worth it. All 750 copies have sold and Concresco is now a rare object. Perhaps the book benefitted from the renaissance enjoyed by self-published and small-run photobooks in general, but Galjaard insists that not all bodies of work, however great, necessarily work or find validation in book form. Concresco is not the first project for which Galjaard has gone subterranean. Between 2006 and 2008, Galjaard made When The Siren Goes, a survey of WWII era bunkers in the Netherlands, and stylistically it sowed the seed for Concresco. Fresh out of the Royal Academy of Art in The Hague, Galjaard had a Leica over his shoulder. He was influenced heavily by Ed van der Elsken but the black and white documentary aesthetic started to wear thin. “Something changed. I couldn’t relate to my own style. I made a 180 degree switch and started working on large format Hasselblad and Mamiya 6×7 cameras. And I began with color. I was still interested in people and in story, but I wasn’t interested in relying on people in the picture to tell the story, so I turned to environment and used space,” says Galjaard. From Rotterdam to Friesland, Amsterdam to Enschede, Dutch towns test their emergency sirens on the first Monday of each month. They’re a throwback to 20th century vigilance and seem to exist only because of civic inertia. After 9/11, the Dutch shelters briefly reentered discussions on security. Two thirds of Dutch people reported that they wanted to be close to a shelter – in spite of the fact the shelters offered next to no protection and modern ballistics would reach you before you reached the bunker. Largely symbolic and an unjustifiable expense the Dutch government effectively mothballed the bunkers in a few years back when they gave town mayors the last opportunity to stock the shelters with supplies. 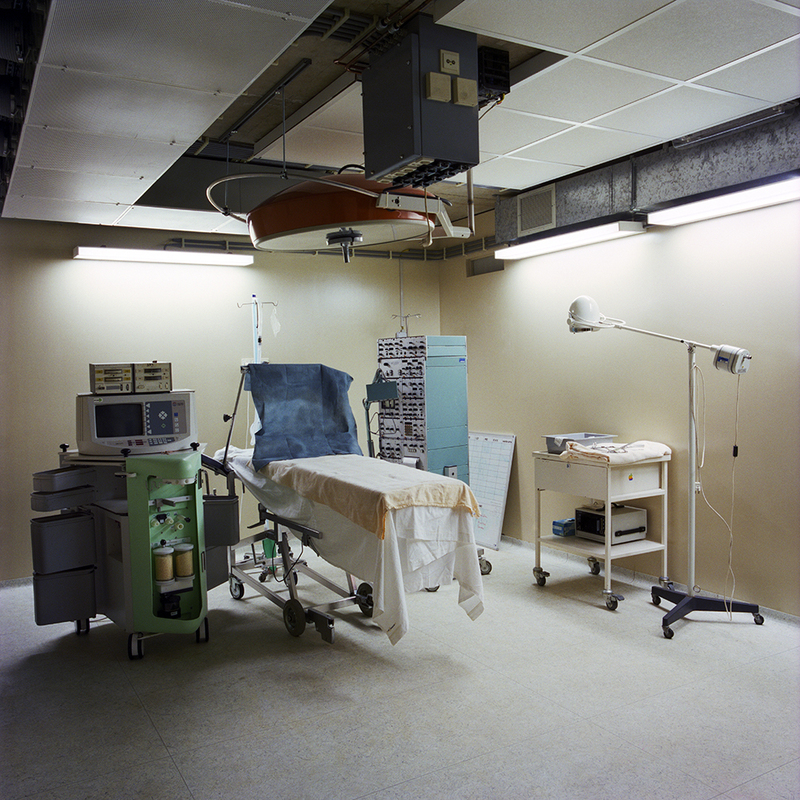 “The bunkers in my photos are the last you’ll find in Holland,” says Galjaard. After friend and journalist Ewout Lamé saw When The Siren Goes, he told Galjaard of the archipelago of bunkers in Albania. “As soon as I read there was anything from 750,000 to a million bunkers in such a small country I really had to see it,” says Galjaard. He waited until winter was over and, in early 2009, drove across Europe for the first of his three trips. For Galjaard, there is a common psychology between When The Siren Goes and Concresco. “I like dark places. It’s probably something from my youth – a suspense and a dangerous feeling. That’s all a sublayer, but I don’t know exactly what it is. I probably have to go to a psychiatrist to find it out,” says Galjaard. After a moment he adds, “It is hard to explain in English.